Hello Lovelies! 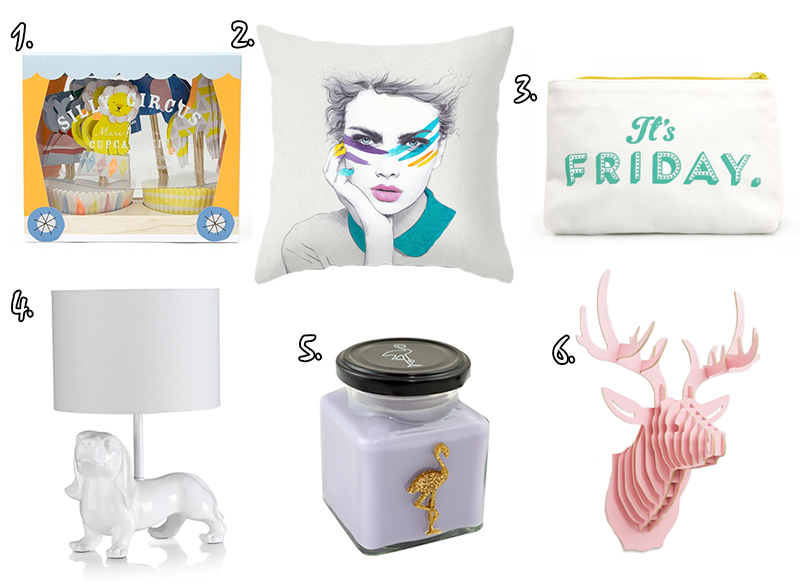 For this week's homeware/gifts picks there isn't really a theme - everything's just a little bit fun and quirky. From a cute little dog lamp, to cupcake decorations that will turn your cakes into a circus all of this week's picks are from Urban Outfitters, Society6, OhhDeer, Flamingo Candles and MandS! 1. Silly Circus Cupcake Kit £10.50 [x] : This cute little cup cake kit, contains 24 cases and adorable toppers to go with them. There are four different toppers: a seal, elephant, giraffe and lion. Perfect for jazzing up any party. 2. War Paint Sally by Jenny Liz Rome Throw Pillow $27.00/£17.50 [x] : I'm not usually one to go for faces on cushions, but I love this war paint sally throw pillow. It's so pretty but fierce all at the same time. 3. It's Friday Multipurpose Pouch £9.95 [x] : It's Friday, Friday, gotta get down on Friday. Everybody's lookin' forward to the weekend (ok now I have Rebecca Black in my head!). I love this cute pouch, perfect for makeup or little bits and bobs - plus who doesn't love Friday? 4. Dexter Dog Table Lamp £44.00 (was £55.00) [x] : Another animal lamp? Yeah I'm a little obsessed but can you blame me? This Dexter Dog table lamp is just so damn adorable! 5. Cheesecake Crunch Classic Square Jar Candle £12.00 [x] : If the cool appearance of this flamingo candle wasn't enough, it sounds like it will smell amazing too with a blend of brown sugar, cinnamon, nutmeg, cocoa, maple, walnut, citrus and caramel. 6. Deer Sculpture In Pink £75.00 [x] : I love deer heads (obviously not the real thing!) and I love the fun twist on this deer sculpture and the colour is so lovely too! Thank you for reading lovelies - and Happy Monday! Let me know what you liked from this week in the comment section below! Nice post :) Kiss from France, Sand. Noooo to Rebecca Black! LOL! I do like the pouch though, simple but chic! Omg haha, I hate the Friday song too! Just so damn catchy! That candle looks amazing - especially as it's cheesecake flavour (my all time favourite!). I know, so pretty and such a cool scent too! Great picks this week. I love the pillow, very unique. I love the candle too! Looks amazing and I bet cheese cake smells great. I have never tried that flavour candle before! Thanks Ellen! And I am so curious about the scent too! Really lovely picks. Love your blog. This is such a cute roundup! I love the dog lamp and the silly circus cupcake set. Lovely post! Thank you Kiki! x Glad you liked it! I'm soo tempted to get the dog lamp! It's so cool! Thanks Josie! And yeah me too, I've been wanting one of their candles for such a long time! Ahh! I love every single one of these! This table lamp is so cute.